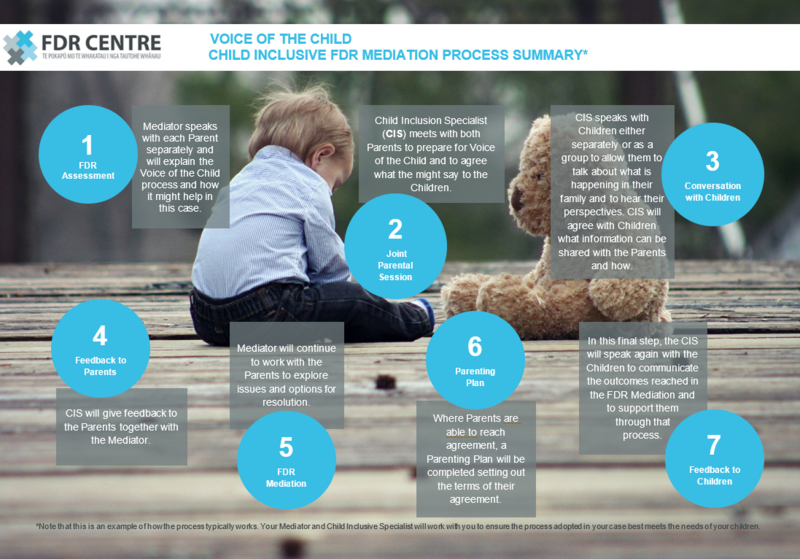 Child inclusive mediation – also known as Voice of the Child – is an important part of the FDR Centre’s FDR Mediation service. The FDR Centre recognises the importance of promoting a child focussed, child inclusive mediation practice to ensure that children’s and young people’s voices are heard as an accepted part of the FDR Mediation process, if the child wishes to be included. 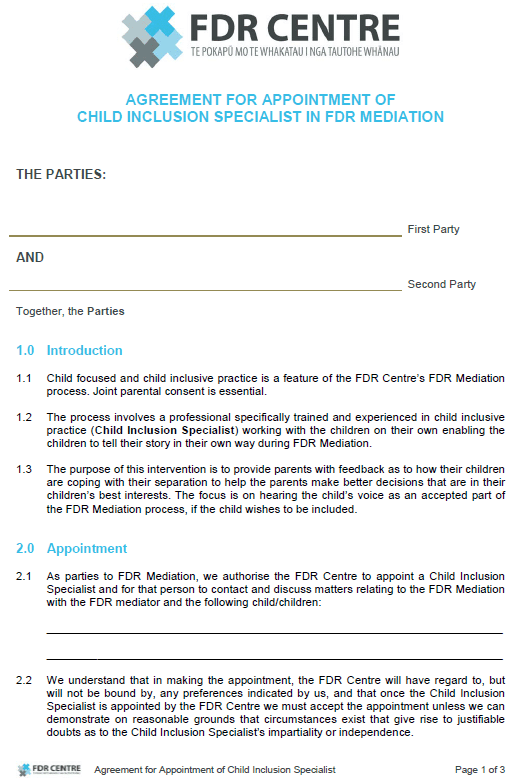 Since early 2015, the FDR Centre has been offering child inclusive FDR Mediation, where children have the opportunity to share their views with a Child Inclusion Specialist, who attends the mediation in the children’s shoes. This process was developed to allow children to talk about what is happening to/in their family, to hear their perspectives, and to provide parents with feedback as to how their children are coping with their separation to help the parents make better decisions that are in their children’s best interests. While there are other strategies that mediators can employ to meet their responsibilities under the legislation, the use of an independent professional ensures that the mediator’s role is not blurred or compromised, and that the children genuinely feel they are heard and listened to in the process. Children have a legal right to be heard in the decision-making process of matters that will substantially affect their lives. The child inclusive mediation process involves the appointment of a professional who is specifically trained and experienced in child inclusive practice (Child Inclusion Specialist). That specialist works with the children on their own, allowing the children to tell their story in their own way during the FDR Mediation. providing feedback to the child after the FDR Mediation on the outcomes agreed by the parents to ensure the child understands the agreements reached in the mediation and to offer support. There is no additional cost for Voice of the Child where that process is provided within the government subsidised FDR Mediation process. During your FDR Assessment, you and your mediator can discuss whether Voice of the Child would be an appropriate option for your case. Prior to us appointing a Child Inclusion Specialist for your case, we require both parties to sign the ‘Agreement for Appointment of Child Inclusion Specialist in FDR Mediation’ (the Agreement). Joint parental consent is essential. Once we receive the signed Agreement, we will appoint a Child Inclusion Specialist who will contact you directly and make arrangements to meet with you and your child/children at the earliest possible time.